All 12 episodes are available now. Listen on the website or on your smartphone, tablet or computer. The Rev. 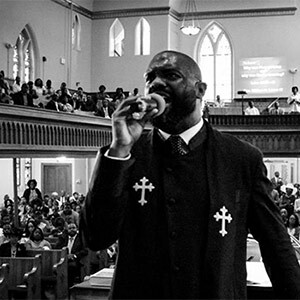 William H. “Bill” Lamar IV is the pastor of Metropolitan African Methodist Episcopal Church in Washington, D.C. He previously served Turner Memorial AME Church in Maryland and three churches in Florida. He is a former managing director at Leadership Education at Duke Divinity. Lamar is a graduate of Florida Agricultural and Mechanical University (FAMU) and Duke Divinity School. He can be reached on Twitter @WilliamHLamarIV. The Rev. 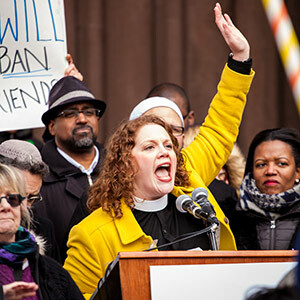 Laura Everett is the executive director of the Massachusetts Council of Churches. Everett, an ordained United Church of Christ minister, previously served as associate director of the council. She is a graduate of Brown University and Harvard Divinity School. She serves on the advisory council of Leadership Education at Duke Divinity. She can be reached on Twitter @RevEverett. Our podcast is a 12-part series of free audio files. When you subscribe, episodes automatically download to your smartphone, tablet or computer. You can also listen on this website, where you will find audio files, complete transcripts and additional information about our guests. Learn more about how to listen and subscribe to a podcast.